The reason it will touch you is because these short five sentences explain how a people could so effectively detach themselves from the policies of their government so that it could ultimately imprison all political enemies and slaughter six million innocent people. Martin Niemoller was a Protestant (Lutheran) pastor who founded the anti-Nazi Confessing Church in 1934. In November 1945, he visited the Dachau concentration camp, where he was imprisoned from 1941 until it was liberated in 1945, and it was this particular visit which is believed to have inspired him to write his now-famous quote. In 1931, Martin Niemoller became a Lutheran pastor in a wealthy suburb of Berlin. Initially, he supported Hitler and most of his policies. But then the Fuhrer began to interfere in church affairs. One of the first laws that Hitler put into effect in Germany was known as the “Aryan Paragraph.” This new rule stated that only Aryans could have positions in the German government; Jews were no longer allowed to have government jobs. The rule was quickly expanded to ban Jews from becoming Pastors in any of the Christian churches in Germany. Meanwhile, in 1934, Niemoller and several other ‘rebel’ pastors established the Confessing Church, a branch of the German Protestant (Lutheran) Church, to resist the German Christians’ Faith Movement (the Reich Church). One of the major distinguishing policies of the Confessional Church was that Jews who had converted to Christianity could become pastors. The Aryan law, as it applied to the catholic church, was a sore spot for Pastor Niemoller. He argued that once Jews had converted to Christianity they should be allowed to remain in the Church. In June 1936, Niemoller and nine other leaders of the Confessing Church signed and sent a memorandum to the Fuhrer. Among other complaints, it specifically attacked the Nazi party’s attempts to force anti-Semitism and hatred of Jews on Christians in violation of the commandment to “Love they neighbor as thyself” and it chastised the party for presenting Christian parents with the dilemma of forcing their children to adopt such non-Christian policies. Six of these leaders were arrested and thrown into prison or concentration camps, and one died under “suspicious circumstances.” Niemoller himself was arrested in 1937, for delivering outspoken sermons. He was arrested later than the others because he was a member of the Nazi Party and had been a war hero; he commanded a sub in WWI and successfully torpedoed and sunk a British vessel. He was held for eight months at Moabit prison without a trial and when his case was finally heard, he was found guilty of “abusing the pulpit” and treason. At that point he was only fined. But as he left the courthouse, he was arrested by the Gestapo and sent to Sachsenhausen concentration camp to be “re-educated.” Niemoller refused to change his views, even after a personal plea from Hitler himself, and in 1941, he was transferred to the infamous Dachau camp, where he stayed until the end of the war. Joseph Goebbels urged Hitler to have him executed, but he was released on April 24th, a few days before the camp was liberated by the Americans on April 29, 1945. [Dachau was one of the three concentration camps in Germany (Dachau, Sachsenhausen, and Buchenwald); It opened on March 22, 1933, less than two months after Hitler was appointed chancellor of Germany, and the first prisoners were Communists, just as Niemoller said. The Socialists, mentioned in Niemoller’s quote were officially known as the Social Democrats. They posed the greatest political risk to Hitler and the Nazi party so that’s why they were rounded up. In fact, all three camps three were located in areas of Germany considered to be hotbeds of Communist and Social Democrat political activity]. Unfortunately, while Niemoller stood up for converted Jews, he otherwise appears to have harbored anti-Semite feelings and openly professed his belief that the Jews had been punished through the ages because they had “brought the Christ of God to the cross.” He delivered a sermon which included, in part: “I cannot help saying quite harshly and bluntly that the Jewish people came to grief and disgrace because of their own actions. The Jewish people bear a curse throughout the history of the world because they were ready to approve of their Messiah just as long and as far as they thought they could gain some advantage for their own plans from Him, His words, and His deeds. They bear a curse because they rejected Him and resisted Him to the death.” Sadly, his very words would support the teachings of the Reich Church. For those who have not yet visited the Holocaust Museum, there is one section dedicated to how hatred for the Jews escalated in Nazi Germany. It followed a carefully-designed plan of propaganda, of course, first outlined by Hitler in the book he wrote while imprisoned – Mein Kampf – and then implemented by Heinrich Himmler, head of the SS and the key Nazi official responsible for conceiving and overseeing the implementation of the Final Solution, the Nazi plan to murder and dispose of the Jews of Europe. Before the Nazis labeled Jews as ” Judenrat” and forced them to wear yellow ribbons, destroyed their businesses and synagogues during the “Night of Broken Glass” (or Kristallnacht; when SS destroyed over 7,000 Jewish businesses and over 1,000 synagogues), seized their property, took away their rights, and rounded them up for deportation to concentration camps, there were more insidious strategies to turn the German people against the Jews. For one, Jews were blamed for controlling much of the country’s banks and finances during World War I and not freeing money up to support the German troops. Jews were accused of stabbed their fellow countrymen in the back. Germany had been forced to ask for an Armistice in World War I because it could no longer finance the war and because the trade unions called for a general strike of all the workers so that the whole country of Germany came to a total stop. Germany lost World War I, even though the country was never invaded and its army was not defeated in the field. Another propaganda campaign was to have German churches teach that Jews were evil and enemies of Christians because they killed Jesus. Martin Luther, father of the Protestant Church in Germany, professed this view back in the 1540s so hostility to the Jews was nothing new in Europe. He even suggested at the time that all Jews be removed from Germany. Luther wrote a book entitled On the Jews and Their Lies, and just about every church and every anti-Jewish book printed in the Third Reich contained references to and quotations from this book. I didn’t write this article to offer praise to Niemoller for his famous quote or to extol any of his virtues. The truth is that his actions during the rise of Nazi Germany and the ensuing genocide were really only to sustain the church and nothing more. He was essentially concerned only when church members were arrested and many were. He did not seem overly concerned with what was happening to the Jewish population or willing to accept any responsibility as a church leader to stand up for the inhumanity that was going on in ghettos, camps, and ovens. I simply want to find the lesson in his story. And I know there has to be a lesson because his quote is so eloquent and so astute. When he visited Dachau in 1945 after he had been released, something about the trip caused him to reflect and appreciate what had happened in Germany. Did he have a change of heart about what happened to the Jews and about his anti-semitic sermons? Perhaps not. Was he affected by the suffering and oppression around him while at Dachau? Probably not. He and other pastors were separated into different facilities and given favorable treatment there. Did he finally appreciate the enormity of the Nazi’s persecution of the Jews? Perhaps. I think the lesson Niemoller finally learned and what he tried to sum up so he could teach us is that innocent people were sent to concentration camps by the Nazis for no reason at all, and because good people did nothing, the result was that in a good person (Niemoller himself) was wrongly imprisoned. Martin Niemoller was a German citizen, a member of the Nazi party, and a Protestant minister in a country that was predominantly Protestant and controlled by the Nazi party. He merely disagreed with his Fuhrer on one simple issue. What this lesson says to me is that we need to stand up for all attacks on liberty with equal passion, even if they might not affect us personally. For those who need healthcare, maybe the fight against socialized healthcare is not your issue. But the underlying freedom that is eroded because of such a government program should be an issue worth your attention. Only you can do the balancing test – between getting a break on healthcare because the government is providing it AND the natural right to decide matters of healthcare on your own and without the government mandating coverage and solutions. For those who don’t agree with the message of Occupy Wall Street, remember that the underlying freedom to protest and disrupt government is one that is vital to us all as Americans and might become even more vital in the months ahead. We all want to feel safe against terrorists who want to do us harm and we believe the government owes us that protection, yet a law that ultimately allows our very government to spy on its citizens and detain us indefinitely for suspicious activity is one that gives an already dubious and untrustworthy government the power to decide what the “suspicious activity” is and who the suspects might be. We have the natural right to be free from harassment from our government. God who gave us life gave us liberty. We need to value our liberties just as we value our lives. Let’s learn the lesson embraced in Niemoller’s quote. Let’s take it to heart. 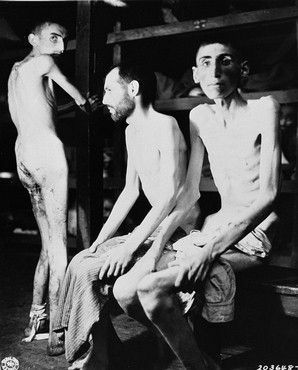 If we can truly appreciate that valuable lesson then maybe the horror of the concentration camps wasn’t in complete vain. Martin Niemoller, “ Exile in the Fatherland: Martin Niemöller’s Letters from Moabit Prison,” (Memoir), 1975. A very powerful reminder that we have a responsibility and urgency to speak up while we have the ability– to protect the precious freedoms we still have. With politics so much in the news at this time, we must also apply the lesson to be sure we understand the background, integrity and intents of any candidate who seeks our vote–because once in office, we will reap the benefits or face the consequences of actions taken by leaders we place in power there!